Background: Complete chloroplast genome sequences provide a valuable source of molecular markers for studies in molecular ecology and evolution of plants. To obtain complete genome sequences, recent studies have made use of the polymerase chain reaction to amplify overlapping fragments from conserved gene loci. However, this approach is time consuming and can be more difficult to implement where gene organisation differs among plants. An alternative approach is to first isolate chloroplasts and then use the capacity of high-throughput sequencing to obtain complete genome sequences. 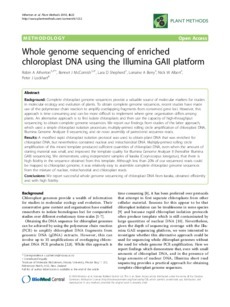 We report our findings from studies of the latter approach, which used a simple chloroplast isolation procedure, multiply-primed rolling circle amplification of chloroplast DNA, Illumina Genome Analyzer II sequencing, and de novo assembly of paired-end sequence reads. Results: A modified rapid chloroplast isolation protocol was used to obtain plant DNA that was enriched for chloroplast DNA, but nevertheless contained nuclear and mitochondrial DNA. Multiply-primed rolling circle amplification of this mixed template produced sufficient quantities of chloroplast DNA, even when the amount of starting material was small, and improved the template quality for Illumina Genome Analyzer II (hereafter Illumina GAII) sequencing. We demonstrate, using independent samples of karaka (Corynocarpus laevigatus), that there is high fidelity in the sequence obtained from this template. Although less than 20% of our sequenced reads could be mapped to chloroplast genome, it was relatively easy to assemble complete chloroplast genome sequences from the mixture of nuclear, mitochondrial and chloroplast reads. Conclusions: We report successful whole genome sequencing of chloroplast DNA from karaka, obtained efficiently and with high fidelity.